During Franz Kafka’s time, Prague was supposedly quite a Kafkaesque place with lots of secrets behind the doors of its ancient buildings. Communism did not help much to disperse this reputation. Now modern science is fundamentally changing the city’s fame and vibrations. 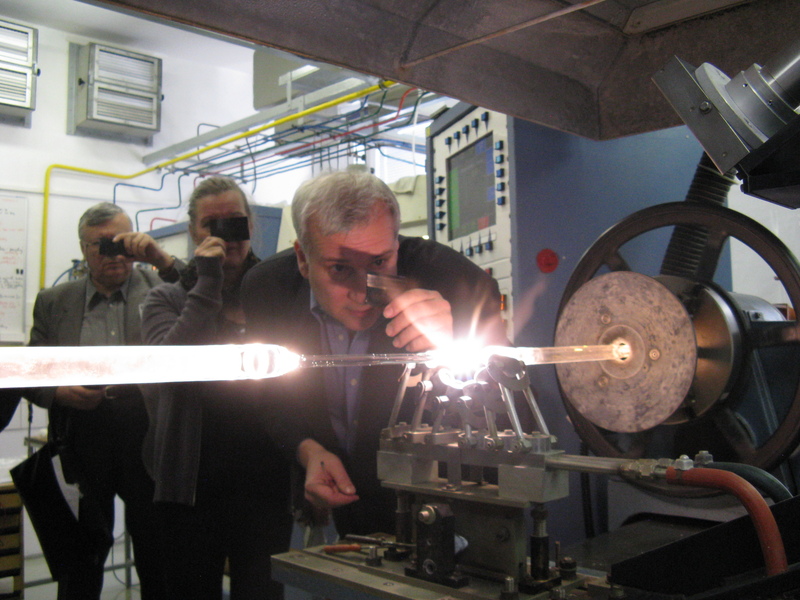 During an EUSJA study trip to the Vlatava capital, laboratories turned into public show cases. Hands-on science with in-depth explanations, impressive experiments and open discussions with accessible researchers demonstrated that Prague ambitiously reaches out to become a major player in the world elite of science. Alas! No charming old buildings any more. Instead a brand new campus with the most modern labs, English is spoken everywhere, a liberal spirit prevails. The physicist Ivan Kasik takes us around the Institute of Photonics and Electronics. Here we are at the forefront of the communication revolution. Kasik and his team are cooperating with leading research organizations throughout Europe to improve the performance of glass fibers. The scientist knows how sci journs tick. In very basic terms, with striking examples and little experiments he explains how this type of glass works and lays out the challenges ahead in fiber engineering. Principally the transparent strings are pipes which transport light waves, which are coded communication signals. With many tricks such as purifying the glass and applying special coatings the material’s efficiency is being boosted. As a carrier of our worldwide communication, highly efficient glass fibers are becoming a prime commodity. Cities and countries with a high fiber index such as Sweden or South Korea belong to the leading high-tech nations. “If we want to further increase the speed of the internet, we have to change the wave length from visible to near infrared”, says Kasik. That would, in the long run, ensure a “fantastic data stream”, he adds. There are many other applications though. Glass fibers can be used as lasers with the light more intensive than 200 suns. They serve to weld and to cut. Also fibers are viable sensors and become increasingly important in chemical detection, emergency systems as well as medicine. Hopefully one day they are able to look into cells, however, they cannot detect cancer or HIV, Kasik corrects speculations which were expressed in some premature media reports. The production of the fibers is outright exciting. Glass is heated up to 2100 degrees Celsius and then threads are drawn, if necessary extremely thin, like “Angelo’s hair” spaghetti, says an Italian colleague. Another one wants to know whether nerves could be made from special glass one day. Kasik does not want to get into other speculations, rather stays on firm ground and demonstrates the production process. 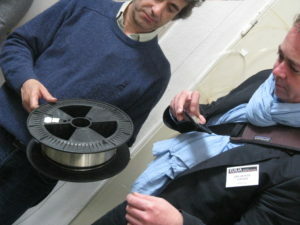 In his lab, a fiber of one kilometer length takes one hour, in an industrial plant only two minutes. Change of scenery. 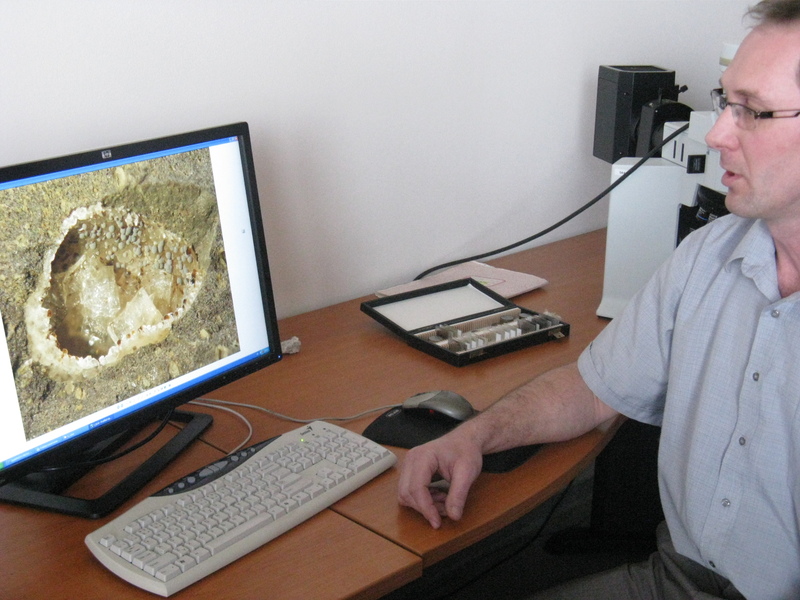 The geologist Pavel Bosak talks about another fascinating topic: minerals. They are our greatest treasure, he says and states: “All materials we use on earth come from the interior of our planet.” At the same time, minerals are a window into our past. They document the entire history of our planet and evolution. Since our earth has been exposed to so many changes, from steamy heat to extreme cold, he cannot believe in the threats of climate change. Therefore he considers himself a climate skeptic, he admits, a position widely not very well accepted, but geologically perhaps justified. For its investigations, Bosak’s institute relies on a series of highly sophisticated instruments such as scanning electron microscopes, X-ray powder refractors, electron probe microanalyzers, superconducting rock magnometers. Looking through the optical systems of some instruments reveals most beautiful and mysterious crystal formations. The institute’s fossil studies contributed to cutting edge research, for example to explore the evolution of jump mechanisms of animals. Analysis of the Egyptian pyramids established the fact that the materials came from very far away – how, no one knows yet. All in all, Bosak concludes, passionately, that geology is a prime scientific discipline, which deserves much more funding. The financial situation remains tight, he confesses. Politicians don’t always understand the needs of science, he regrets with diplomatic politeness; and, may be, there could be more public debate about research and its goals, he hesitantly agrees with one participant of the tour. After glass fibers and minerals the next stop are plants. The biology institute emphasizes a focus on medicine, for instance the development of anti-cancer properties and GMOs, genetically manipulated plants to be used as new vaccines. The highlight, as it turns out, is to peer into a cell and witness a cell division, almost just as dramatic as Hollywood presents these wondrous processes of life. On the other side, very reconciling the fact that biology also can do without expensive instruments and yet progresses, rather naturally by means of conventional breeding and crossing. This, for example make apples more resistant against invaders. Many species like Red Topaz don’t require chemical treatment any more. Probes circulated around in slices reveal that the outcome is delicious. 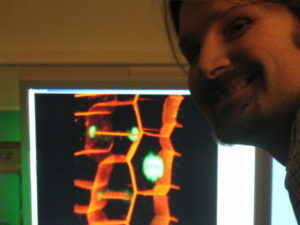 Photographs at the lab’s walls show how far this organic method extends. Apple trees have turned into vertical wooden columns which facilitate the harvest of the popular and healthy fruits. This all pays off. 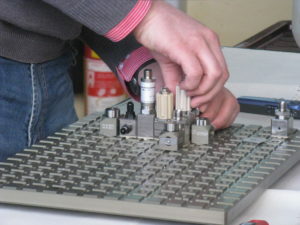 Licenses produce a yearly income of 200 000 Euros for the institute. The next demonstration is on a screen. Milan Hajek, Prague’s expert on microwave technology, apologizes: There is no space right now in his lab. Although rather dry and abstract, he manages to catch the attention of his audience. Drying books and valuable papers after floods and natural disasters is very difficult and so far has almost been impossible. His team deploys microwaves, so well controlled that they don’t leave any spots. The other field of research is street repairs. After this long winter period roads all over Europa are severely damaged. Microwaves can help. They enter the asphalt by ten centimeters and dry it almost instantly, providing the conditions for a swift repair. Then this study trip’s final visit: Microreactors which look like lego. Assembled and connected with each other they produce chemicals. Amazing, the purchase of one piece easily runs up to 10 000 Euro. But it withstands pressures of 100 bar! The set-up reminds of a little steam engine which children in the 1950ies used to play with. In the old days, they drove tiny saws and hammers, now they synthesize wash lotions, pills, dynamite. The chemical engineer Jiri Kristal explains the advantages of this new production line: safer, more energy efficient, better control, “the way to go”. A pragmatic, no word about the fiction-like perspectives: factories of the size of chips, which can be inserted everywhere, in bodies – may be also premature, although laboratories on a chip have already been state of the art for years. Saturday evening, after 6 pm. A closely tacted all-day marathon around Prague’s new high-technology campus at the outskirts of the city comes to an end. We look around. The scientists and their staff are less exhausted than the visitors. They really must like what they are doing and share it with critical audiences like science journalists. Kafka would have enjoyed the tour! Návštěva zahraničních novinářů na Ústavu chemických procesů – UCHP v. v. i.